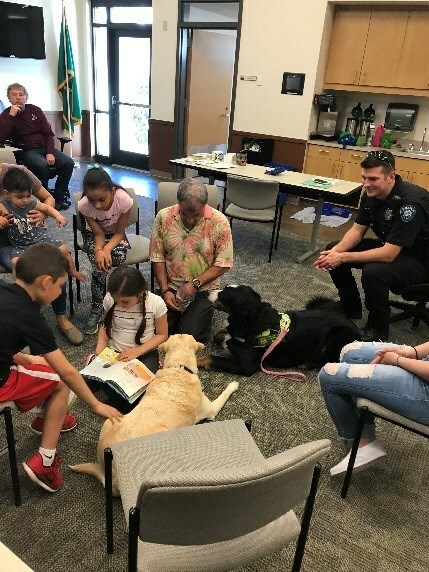 Laws and Paws is a program sponsored by the King County Sheriff’s Office Foundation, a non-profit 501c3 organization, whose mission is partnering Sheriff’s Deputies and volunteers with the youth of King County. Laws and Paws incorporates dogs with an array of projects such as reading programs, canine care and bringing joy through interaction between youth and dogs. The main goal of these events is to interact with the community beyond the typical “police interaction” and to give the children a fun time with some great dogs. The target audience is elementary school aged children and their families but all are welcome if they want to read or just say hello to the dogs. We will make it work with whomever shows up. We often run until at least 5pm so feel free to show up any time before then, no need to show up at exactly 4pm. The kids can read to the dogs then we try to have a play time where the dogs show off some tricks and chase some balls. We received a few boxes of donated books that the children can read to the dogs and then take home with them. Stella and Bentley are the two primary pups. They are Bernese Mountain Dogs who have had training in emotional support. Presto is a Labrador who was an early addition and is fantastic with the children. We may have more that we vet for events as the program grows.